* Avacadoes: they have ots of B-complex vitamins and are an anti-inflamatory, which is great for the skin. * Green Tea: technically a drink, green tea has polyphenols which are an anti inflamatory. * Spinach: it is loaded with vitamins and minerals. especially high concentrations of vitamins K and A and manganese and folate. It also helps fight against osteoporosis, heart disease, colon cancer, ovarian cancer and arthritis. * Rockmelon: plenty of vitamins A and C - two vitamins your skin needs to stay healthy. * Citrus fruit: oranges and grape fruit are full of vitamin C which helps to keep wrinkles at bay. * Bananas: these have the B vitamin biotin, which helps build healthy skin, hair and nails and helps to prevent skin irritations such as dermatitis. * Tomatoes: like bananas, tomatoes have biotin and also lycopene, which helps prevent cancer. 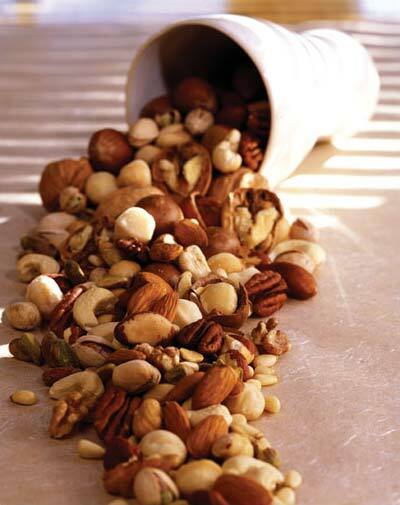 * Hazelnuts: Another great source of vitamin E which also offer protection against cancer andf heart disease. * Olives: these provide both vitamin E and anti-inflamatory properties which help promote healthy skin. Also very high in iron. * Brazil Nuts: these are high in selenium, which can reduce the chance of sunburn on the skin, slow down the aging process and aid in treatment of skin cancer. * Cottage cheese: Eat this to get loads of calcium and selenium for your skin. You can use in place of ricotta in recipes. * Walnuts: these are packed with omega-3 and omega 6 EFA's which promote skin repair and elasticity.